For Revolutionary Defense of Cuba! On June 5, the 11th Circuit Court of Appeals in Atlanta upheld the convictions of the “Cuban Five.” The sentences of René González (15 years) and Gerardo Hernández (2 life sentences plus 15 years) were upheld. At the same time, the three-judge panel vacated the sentences of the other three. Ramón Labaniño (life sentence plus 18 years), Fernando González (19 years) and Antonio Guerrero (life plus 10 years) are to be resentenced in a hearing to be held in Miami, which is notoriously infested by Cuban gusanos (“worms”), the counterrevolutionary scum who for decades have waged a dirty terrorist war against the Cuban people. The Five have committed no crime, but rather they heroically risked their lives to defend the Cuban Revolution against terror attacks launched from the U.S. We demand that the Cuban Five be freed, now! For almost a decade the Cuban Five have been held in separate federal high security prisons in Florida, California, Colorado, Kentucky and Indiana. They were among ten Cuban immigrants arrested in September 1998 and accused of being part of a Cuban spy ring. At the time, prosecutors presented evidence that the five had infiltrated the gusano outfit Hermanos al Rescate (Brothers to the Rescue) and other ultrarightist terror groups in Miami. Some were also accused of conspiracy to commit espionage. Since there was no evidence of secret U.S. military or intelligence information being obtained, or even sought, the prosecutors later threw in the additional charge of conspiracy to commit murder. Under draconian U.S. conspiracy laws no actual espionage or murder has to be proved, only a supposed agreement (even implicit) to commit such acts. There is no question that the Five sought to obtain information about the activities of gusano terrorists in Miami, and that they successfully infiltrated some of these murderous squads. The information they supplied to Havana was then passed on to the U.S. government. When Washington naturally did nothing about it (after all, the U.S. is the sponsor of these mercenaries), the Cubans gave the New York Times names and addresses of these assassins, and locations of their paramilitary training camps. The Times, which considers itself the quintessence of the “free but responsible” imperialist press, didn’t publish a word about this, just as it suppressed news of preparations for the 1961 Bay of Pigs invasion. The Five also reportedly gathered information about U.S. military activities, but all of this was gleaned from publicly available sources. The legal odyssey of the Cuban Five is a case history in capitalist injustice. The 2001 trial was held in Miami, home to 650,000 Cuban exiles. The right-wing press whipped up a hysteria against the government of Fidel Castro. The foreman of the jury openly expressed his hatred of the Cuban leader, and the jury declared the defendants guilty on all 26 counts without asking a single question. In August 2005, a three-judge panel of the 11th Circuit Court of Appeals unanimously threw out all the convictions and ordered a new trial on the grounds of the location and prejudicial publicity. But the U.S. government appealed the ruling to the full court, which in November 2005 reinstated the original convictions. The defense then appealed, leading to the latest ruling by another three-judge panel of this court. 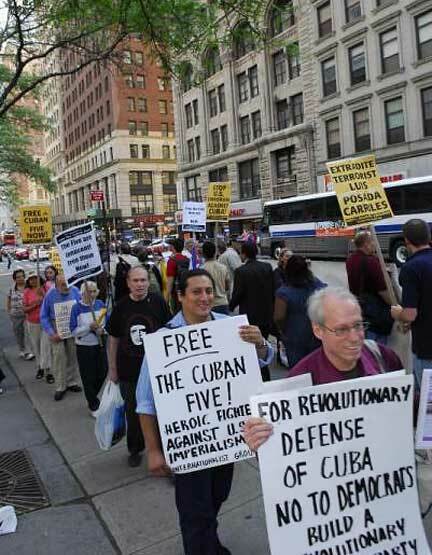 Various human rights organizations have objected to the rigged trial and persecution of the Cuban Five. The United Nations Commission on Human Rights denounced the arbitrary detention of the prisoners, calling on the U.S. to rectify this abuse. Amnesty International has criticized the U.S.’ refusal to grant visas to the wives of René González and Gerardo Hernández so that they can visit their imprisoned husbands. Eighteen Nobel prize winners have written to the U.S. attorney general asking for release of the Five. All of this has predictably fallen on deaf ears, for the Yankee imperialists are still desperate to crush the Cuban Revolution almost half a century after Castro’s guerrillas toppled the corrupt U.S.-backed dictator Fulgencio Batista on 1 January 1959. A number of the defenders of the Cuban Five seek to tiptoe around the issue of the Hermanos al Rescate, two of whose planes were shot down by Cuban Air Force pilots on 24 February 1996. They emphasize that there is no evidence that the Five “conspired” to have the gusano planes shot down, which is true. But as Trotskyists who defend Cuba against imperialism, we unequivocally defend the shootdown of the Hermanos planes as an act of self-defense. The planes violated Cuban airspace that day and had repeatedly done so in the previous weeks. A Cuban air force pilot who had infiltrated the Hermanos gang returned to Cuba to denounce their provocative activities at a press conference the day before the incident. The U.S. was well aware of these brazen provocations. An internal State Department memo warned that “one of these days the Cubans will shoot down one of these planes.” On February 24, the pilots were told by Cuban air traffic control that they were entering prohibited airspace and putting themselves in danger. The Hermanos leader, Bay of Pigs veteran and “ex-”CIA agent José Basulto laughed (he survived), and they continued on. The United States has waged a relentless war on Cuba, from the 1961 Bay of Pigs invasion to the hundreds of plots to assassinate Fidel Castro to the decades-long economic embargo aimed at starving the island into submission. The gusano terrorist attacks could not take place without the knowledge, and in many cases outright approval of the U.S. government. These include the bombing of hotels and tourist spots in Havana, the murder of a Cuban diplomat on the streets of New York, the attempted bombing of the Cuban mission to the United Nations, and the shooting down of a Cubana Airlines plane in October 1976, killing all 73 people on board. The authors of that attack, Orlando Bosch and Luis Posada Carriles, who has admitted organizing terrorist bombings, walk freely around Miami, protected by the U.S., while the heroic Cuban Five have been jailed for almost a decade. Bourgeois liberals may criticize a blatantly rigged trial, but they are not about to defend Cuba. After all, Democrat John F. Kennedy launched the Bay of Pigs invasion and it was the Democratic administration of Bill Clinton that arrested the Cuban Five. Recently, the presumptive Democratic nominee Barack Obama on May 23 gave a disgusting speech at a Cuban American National Foundation luncheon in which he vituperated against the “tyranny” of the Castro regime! This from a representative of U.S. imperialism which maintains its infamous torture center at the Guantánamo Naval Base stolen from Cuba. Those defenders of the Cuban Five who look to Democratic “elected officials” to aid them are searching in vain. Likewise, Noam Chomsky and other liberal luminaries viciously denounced Cuba when in 2003 it jailed scores of Cubans who had been meeting with U.S. diplomats and receiving U.S. funds, and executed several hijackers of a ferry. The arrests and ferry hijacking took place in the immediate aftermath of the U.S. invasion of Iraq, when the Bush regime was using its “shock and awe” strategy of massive bombing to create panic in Baghdad. No doubt it hoped to provoke a wave of “raft people” heading into the Caribbean from Cuba as well. Shamefully, various opportunist would-be socialists from the outright reformists of the International Socialist Organization to the centrist pseudo-Trotskyist Spartacist League joined the liberal hue and cry, at a crucial moment when it was the duty of all revolutionaries to stand at their posts in defense of Cuba. The Internationalist Group and League for the Fourth International oppose the death penalty in Cuba as we do in the United States and throughout the world. We denounced the 1990 Stalinist show trial of General Arnaldo Ochoa, which was part of an effort to gain favor with the U.S. in the “war on drugs.” But the execution of the ferry hijackers was an elementary matter of military defense against a counterrevolutionary act of war, to which it was necessary to give a firm response. Some of the initial appeals for the Cuban Five sought common ground with the U.S. against “terrorism.” Yet the U.S. government is by far the greatest sponsor of state terrorism in the world, much of it directed against Cuba. Indeed, the Five were arrested shortly after the Cuban government handed information they had gathered about gusano terrorist activity to the U.S. Washington’s predictable response was to arrest the messengers, not the terrorists. We Trotskyists defend the Cuban bureaucratically deformed workers state against imperialism – first and foremost the U.S. imperialists, but also against their Spanish, British and Canadian counterparts – while fighting for a workers political revolution to oust the bureaucracy and defend the gains of the Cuban Revolution against the danger of counterrevolution from within and without. It is no secret that important elements of the Cuban bureaucracy would like to negotiate a deal with Washington. Yet the U.S. imperialists have made it quite clear that they are not the least interested in “peaceful coexistence” with a Cuban workers state, and any restoration of capitalism on the island will be a bloody affair. With the retirement of Fidel Castro and the substitution of his brother Raúl at the helm, the imperialists will seek to intensify pressure on the besieged island.